Nine single-story designs are available for homebuyers at Trilogy at Tehaleh. They range in size from 1,507 to 2,462 square feet. Homebuyers are invited to tour the inventory at the resort neighborhood for ages 55 and older. 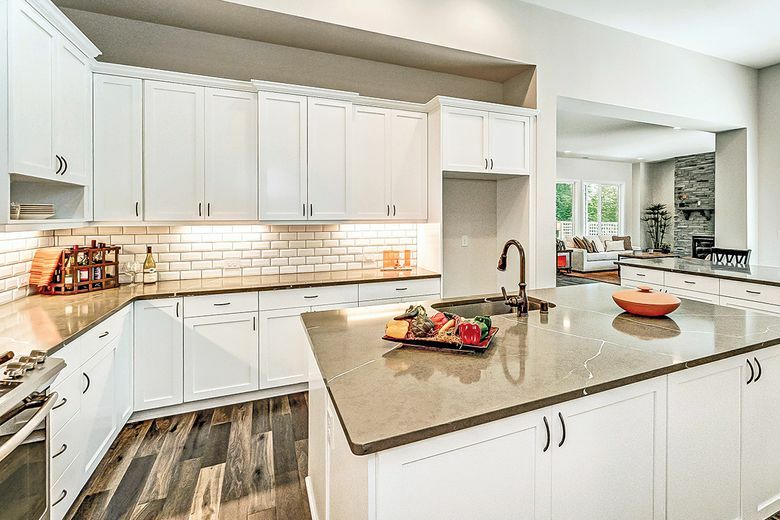 BONNEY LAKE — At Trilogy at Tehaleh, a number of quick-move-in homes are available or will be completed in the next couple of month, shortening the wait time for buyers at the resort neighborhood for ages 55 and older. The Bainbridge model on homesite 3054. Designed with entertaining in mind, the two-bedroom, two-bath home has 1,869 square feet of living space and a two-car garage. The open-concept home is full of upgrades. The kitchen features quartz countertops, white cabinetry with tile backsplash, and a large island that’s a natural gathering spot. The home also includes a spa-like master suite, and guests will appreciate their own private quarters at the front of the home. The Genova model on homesite 3016. The two-bedroom, two-bath home has 2,176 square feet of living space and a three-car garage. The gourmet kitchen anchors the open-concept main living area and features upgraded countertops, cabinetry, backsplash and appliances. A fireplace serves as the focal point in the great room, and engineered hardwood flooring adds style throughout the home. The outdoor living space includes a spacious covered patio. The Tarragona model on homesite 1091. The two-bedroom, 2.5-bath home has 2,462 square feet of living space and a three-car garage. Designer-selected upgrades include engineered hardwood flooring, a stone fireplace, and a gourmet kitchen that’s fit for a chef. With a den, formal dining room, great room and two outdoor living areas, there’s no shortage of social spaces in the Tarragona plan. The master suite features quartz countertops, tile floors, tile-surround shower, and a sliding glass door that leads from the master bedroom to the covered patio. The Pebble Beach model on homesite 3034. The two-bedroom, two-bath home has 1, 507 square feet of living space and a two-car garage. The open-concept layout of the Pebble Beach balances form and function. The kitchen features stainless steel electric appliances, quartz countertops, and cabinets with crown molding. The master suite has upgraded carpet in the bedroom, chrome fixtures in the bath, and a walk-in closet. 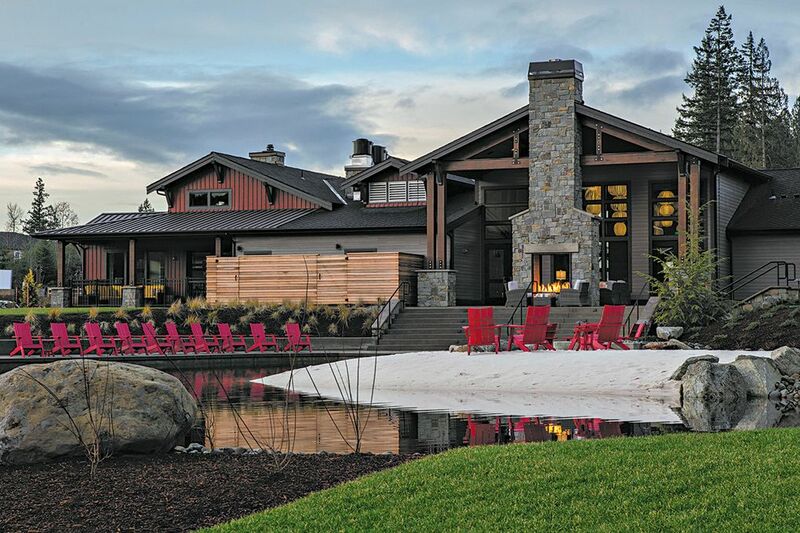 Seven Summits Lodge includes a restaurant; a fitness center; and a private space for parties, cooking demonstrations, viewing parties and classes. Trilogy at Tehaleh offers nine single-story floor plans that range in size from 1,507 to more than 2,400 square feet and include two or three bedrooms. Homes are priced from the $400,000s and include spacious kitchens, master suites and great rooms.